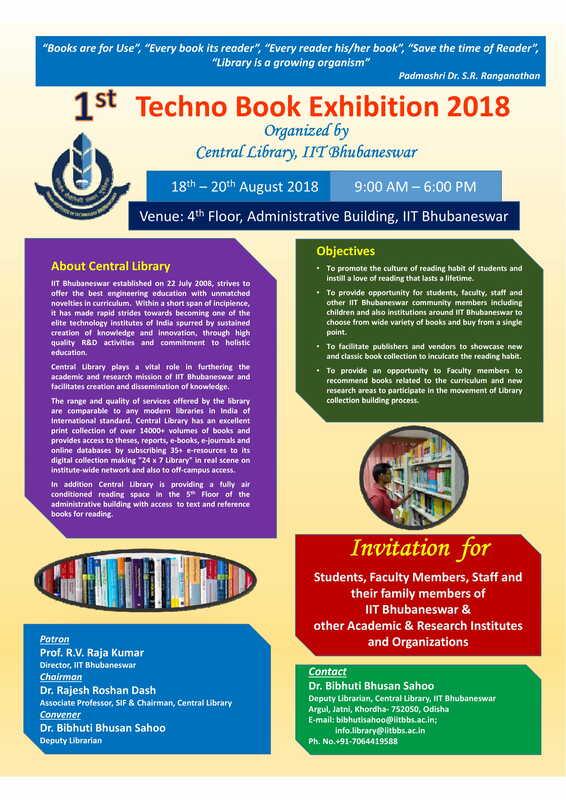 Central Library, IIT Bhubaneswar under the leadership of Director Prof. R. V. Rajakumar is going to organise the 1st Book Exhibition after final shifting of all operations from the city of Bhubaneswar to its fully operational green, inspiring and lustrous campus at Argul. Reputed publishers and all empanelled suppliers are invited to participate and bring textbooks and reference books in the areas of Science & Technology, Engineering Systems , Manufacturing & Systems Engineering, Natural Resources Management, VLSI Design and Wireless Technology, Management & Control of Power Equipment and Systems, Photonics, Electronic Application in Human Endeavours, Nano-science and Nanotechnology, Rural Technology etc to the exhibition. Also the participating publishers are expected to bring books related to the works of Nobel Laureates, works of Celebrated Indian Scientists & Technologists and remarkable classics books on literature, fiction, philosophy, and books of interest for the children, who usually constitute a large part of the visitors to the book exhibition.